A great way to learn how to increase and decrease the flat brick stitch on the end is to make these fantastic brick stitch diamond shapes. They are perfect as dangles in earrings, a necklace pendant, bracelet centerpiece or as part of a station necklace. When we started with brick stitch, we always learned to start at the widest part of the design with a ladder stitch and use a decrease to work to the center. A good example is these contemporary brick stitch earrings. What we didn't realize is how easy it is to start at the point and increase on the ends to the widest area. And the funny thing is our brick stitch seems to be more even when we start at the point and increase than when we start with a ladder stitch, which can be difficult to get perfectly even. For this project, we are using 11/0 Miyuki Delica beads in three colors, WildFire thread and a tulip beading needle (slightly bent at the tip). This project definitely works best with ​delica or other Japanese cylinder beads because of their even shape and size. It can be made with any type of beads though your results may not be as perfectly aligned and even as these. To start the diamond shape, join two beads together with a ladder stitch. This part of the project is not brick stitch increase or decrease, It is just adding a bead to finish the diamond shape and also add a jump ring if you want. To add the jump ring as shown in the photo, pick up a bead and a 3.5 mm 20 gauge jump ring. Stitch back through the bead and down into the other side of the ladder. Repeat to make sure the jump ring is secure. Make sure the jump ring is either soldered closed or very even or the thread can slip through the jump ring opening. Pull the thread tight to secure. An alternative to attaching the jump ring is after exiting one of the beads on top, pick up another 11/0 ​bead and stitch down through the bead on the other side. This will add a bead to the top sideways, allowing you to add a jump ring later. Increasing brick stitch on the end is the same stitch as a regular flat brick stitch. This describes how you will add a bead to the beginning of a row, increasing the row size by one half of a bead. Basically, if you stitch into the first thread bridge, the stitch will always result in the beads being offset and sticking out from the prior row. To begin the increase, pick up two beads and stitch under the first thread bridge between the two beads on the prior row. Stitch back up through the second bead you just added to secure it into place. Pull the thread taut. The beads will lock into place and look like the picture. To complete the row of brick stitch increase, you will need to stitch through the same bridge again. Pick up one bead, stitch under the same thread bridge. You will be stitching slightly underneath the last bead you added. Push the bead you just added to the side so it aligns with the others you just added on the row. Stitch back up through the last bead you added to secure it in place. Pull the thread taut. The brick stitch increase is complete. If the beads are not laying even, you can move them slightly using your needle, but usually, this is not necessary when you are doing an increase stitch. Continue stitching rows, in the same manner, to increase the diamond shape until you have reached the desired width of the shape. Our diamond is six beads wide. The next steps will show you how to decrease the brick stitch on the sides. To start the brick stitch decrease, pick up two beads to start the row like you normally would. However, instead of stitching into the first thread bridge of the prior row, you will skip the first bridge and stitch under the second one. Complete the brick stitch by stitching up through the second bead you just added. One thing you may notice is that the first bead may be twisted slightly. You can adjust it with your needle. When you pull the thread taut, you may find that the end bead twists again. This happens for two reasons: First, the thread area is longer and doesn't hold the bead as firmly in place causing the bead to twist slightly. The second reason is that the first bead is not secured in the same way brick stitch normally is. It does not connect to a thread bridge directly underneath, but off to the side, so it is more likely to turn. A locking stitch can be used to keep the bead in place, preventing it from shifting or turning to the side. A locking stitch is used to keep the edge beads of decreasing brick stitch from twisting out of place. To start a locking stitch, stitch back down the first bead you added on the row. Complete the locking stitch by stitching back up through the second bead on the row. This is similar to adding a single ladder stitch at the beginning of the row. A locking stitch does not always seem to be required, but we find our beadwork is always neater when we use it with stitch decreases. Once you complete the locking stitch, your brick stitch decrease will be as straight as the other brick stitches. Continue the rest of the brick stitch row. You don't need to do anything special to decrease at the end of the row. Just stitch a single bead into the last thread bridge and the row will naturally decrease. Continue in the same manner, decreasing the brick stitch at the beginning of each row by stitching under the second thread bridge instead of the first. Then add a locking stitch to keep the beads straight. When you reach the last two beads, complete the diamond by adding a bead and a jump ring like you did in the beginning or by simply adding a bead sideways. To finish the diamond component, weave the working thread into the beadwork and secure with a couple of half hitch knots. The best way to trim the thread ends with brick stitch shapes is to use a thread burner. If you look closely in the next picture, you can see where we trimmed the thread ends with embroidery scissors and there is still a tiny nub left in the beadwork. The thread burner does a great job of allowing you to burn off the end all the way into the bead. Although the difference is very slight, two of these diamond shapes were made using the increase and decrease method described in this tutorial, while the third was made the way we originally learned - with a center strip of ladder stitch and decreasing brick stitch for each row. we think if you look carefully, you can see the diamond shape on the left is ever so slightly more crooked than the other two. The difference is very minor, but now that we have tried the increase and decrease method, we think we prefer it. 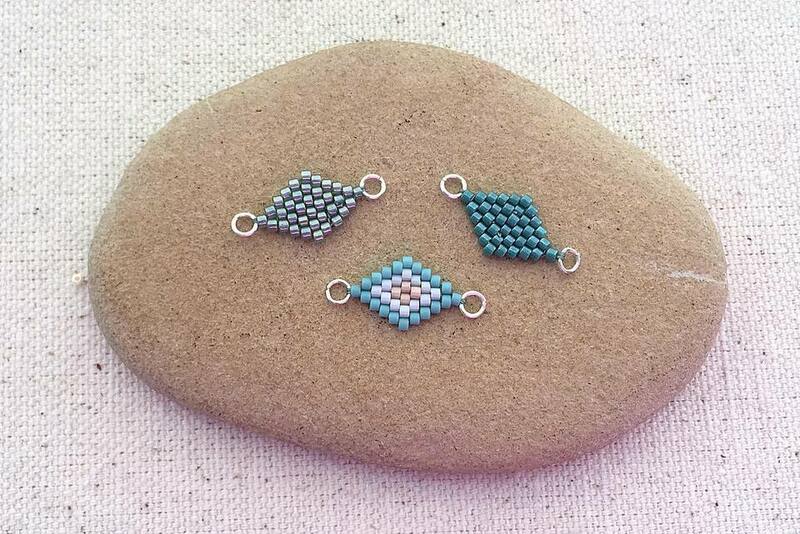 We will definitely try to make brick stitch triangle earrings in the future doing an increase stitch instead of starting in the middle and decreasing.